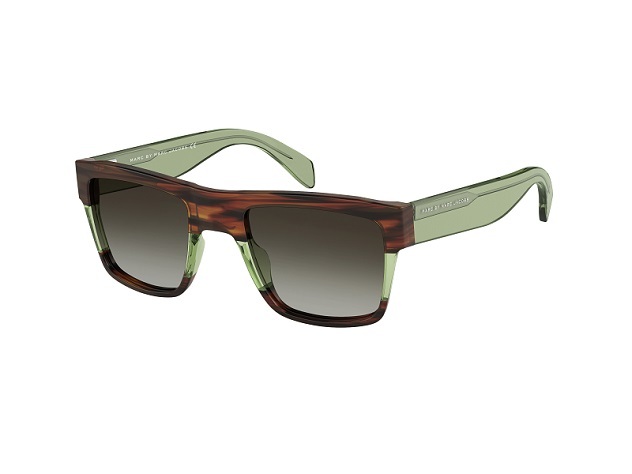 presents new sunglasses and optical frames highlighting the brand’s irreverent spirit. The new 2015 eyewear is interpreted with innovative creativity with vintage-inspired geometric and round sunglasses, enhanced by bold colors. Fearless and edgy, the color-blocked shapes offer a new interpretation Marc by Marc Jacobs’ iconic stripes. These vivid geometric sunglasses, offered in a daring hexagonal shape, make the ultimate accessories for unconventional tough girls. 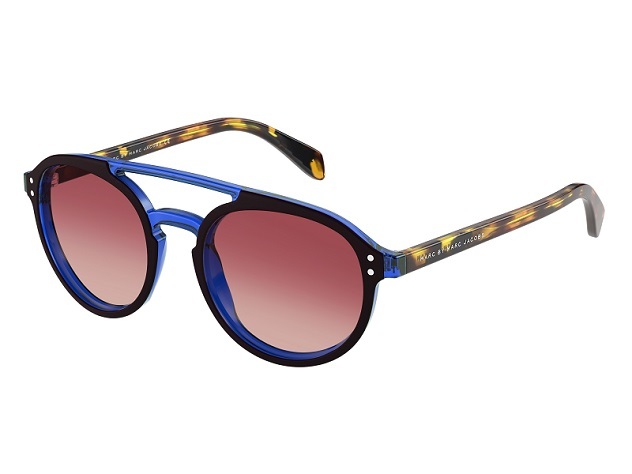 The color palette includes striking shaded effects of black/bluette with grey shaded lenses, blue/yellow with blue shaded lenses, pink/yellow with pink lenses. 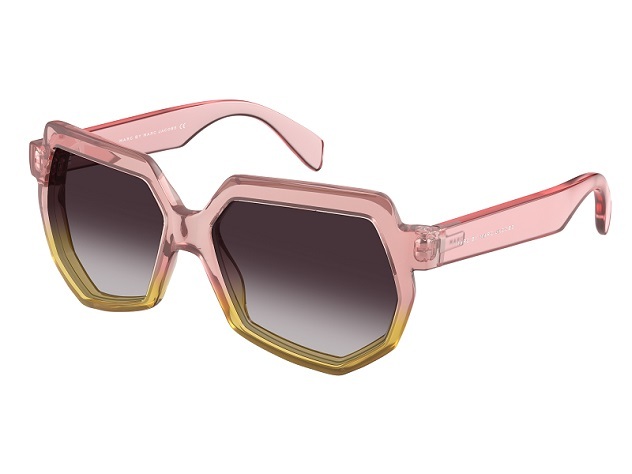 Playful yet sophisticated, these women’s butterfly-shaped sunglasses and men’s squared shape feature a color-block effect, similar to the iconic stripes of Marc by Marc Jacobs accessories. The glasses are available in interesting color contrasts in a variety of milky and pastel hues, including, azure with grey, pink with beige, beige with havana, brown with havana orange with brown, black with crystal and more. With a nod to retro but with a colorful modern flair, these round men’s sunglasses have a very distinctive arched double-bridge. They are offered in vintage-inspired color combinations including havana/orange, black/grey and havana/blue havana/bluette. The 2015 Asian fitting eyewear is interpreted with innovative creativity in the vintage-inspired geometric and round sunglasses, enhanced by bold colors. Fearless and edgy, the color-blocked shapes offer a new interpretation Marc by Marc Jacobs’ iconic stripes. 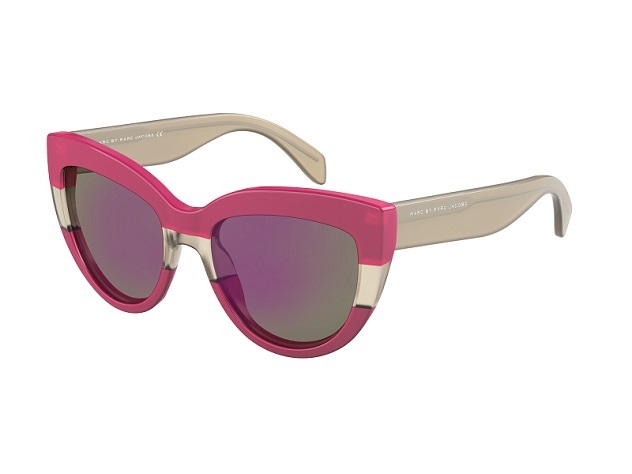 Feminine and playful these acetate women sunglasses feature the brand’s iconic “heart and donut” detail on temples. The flattering oversized round shape makes this style easy to wear yet trendy and cool. Shaded of black/dark grey and shaded grey lenses, brown/havana and shaded brown lenses, pink/milk pink and red/brown lenses and blue with blue lenses are available for this model that comes also with the variant of mirror lenses for the shades of blue and pink. Cat eye shape and the House’s signature detail - the “Metal bow”- are the main feature of these Asian fitted acetate sunglasses. The style, inspired by the jewelry line of the brand, comes in vibrant and elegant tones of black with shaded grey lenses, blue with blue or mirrored blue lenses, brown havana with shaded brown lenses and milky pink with red/brown or mirrored pink/violet/gold lenses.